The following table lists all functions of the HDR-Jack 2. They are activated by pushing the small "extra" button. Modes 1 to 5 provide different bracketing series and an interval function. Modes 6 to 17 allow the configuration of the trigger. This is the all-purpose bracketing series with an EV step of 2. The nominal exposure times are 1/125, 1/30, 1/8, 1/2, 2, 8 and 30 seconds. The shortest time might vary strongly depending on the camera. The hold time of the button is used as the interval period. The duty cycle is approx. one. Example: Holding the button down for 4 s results in a trigger sequence with 2 s on and 2 s off. This is a short bracketing series for daylight conditions with an EV step of 2. The nominal times are 1/200, 1/60, 1/15, 1/4 and 1 second. The shortest time might vary strongly depending on the camera. This is a short bracketing series for daylight conditions with an EV step of 1. The nominal times are 1/200, 1/125, 1/60, 1/30, 1/15, 1/8, 1/4, 1/2 and 1 second. The shortest time might vary strongly depending on the camera. This is a short bracketing series for low light conditions with an EV step of 2. The nominal times are 1, 4, 15, 60 and 240 seconds. 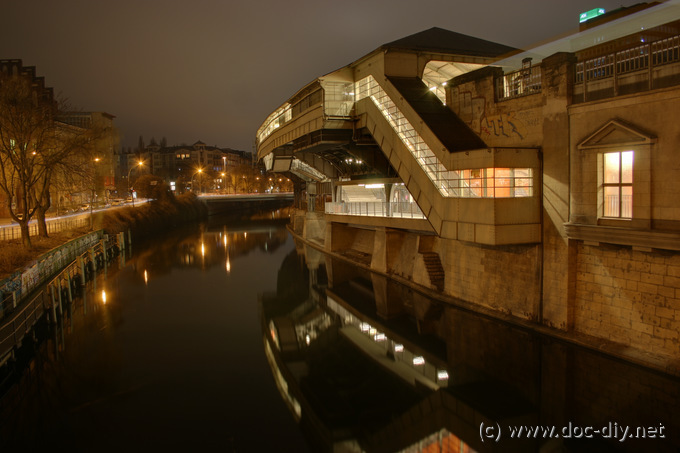 This is a short bracketing series for low light conditions with an EV step of 1. The nominal times are 1, 2, 4, 8, 15, 30, 60, 120 and 240 seconds. This is the all-purpose bracketing series with an EV step of 2 and mirror lock-up support. The nominal exposure times are 1/15, 1/4, 1, 4, 15 and 60 seconds. This is the all-purpose bracketing series with an EV step of 1 and mirror lock-up support. The nominal exposure times are 1/15, 1/8, 1/4, 1/2, 1, 2, 4, 8, 15, 30 and 60 seconds. This function has been left blank intentionally to avoid unintended change of settings. Using these functions the time gap between the exposures in the bracketing sequences can be changed. The value is saved permanently in the EEPROM of the microcontroller. This feature has been implemented to optimally exploit the possibilities of the camera in use and keep step with the development. Setting a larger gap gives you possibility to check the histogram in the preview after each exposure so you can abort the bracketing and save time. The minimum bulb exposure time of some camera modells might be longer than the times provided by the HDR-Jack 2. The effects are skipped shots or jumping exposure times. To avoid unnecessary waiting or unusable shots, you can skip the shortest times according to the description in the table. The limiter is also practical if the first shots result in the same exposure level. These functions allow to change the way the trigger pulse is generated. Different camera modells behave differently depending on how the trigger signal is applied. DSLRs of the EOS xxxD series and the 1000D show best reproduction of the nominal exposure times when triggered using the shutter wire only. In contrast, the EOS 40D needs always both wires for bulb exposure. The interval mode requires no special settings on the camera. It is recommended to use manual focusing especially for dark scenes to avoid missed triggers caused by focus hunting. The HDR-Jack 2 uses the bulb mode to control the exposure time. This very simple principle avoids complicated protocols and is compatible with many camera types, but also has its limitations. The biggest one concerns the minimum exposure time. To my knowledge, the shortest exposure time observed with a Canon DSLR in bulb mode is about 1/200 s. With other brands this time becomes even longer (measured 1/10 with Nikon D80, 1/8 wit Sony a350, heard of 1/60 with Pentax). Unfortunately it is not possible to control the camera properly at very short times. Older Canon cameras without live-view seem to perform better than newer ones. For live-view types from Canon exposure times shorter than approx. 1/4 s become increasingly instable and might be missed by the camera. Another limitation concerns the EXIF data generated by DSLRs in bulb mode. Canon limits the precision to seconds, so every exposure under 1 s will result in an EXIF exposure time of 1 s. Sony cameras write 1/10 s for every bulb exposure under 1 s.
Basically all cameras with a cable remote control connector and the bulb exposure option are compatible with the HDR-Jack 2 if the aforementioned limitations are taken into account. The following table lists optimal settings for different camera types. The data is obtained from own tests or is reported by users. You are welcome to contribute! The exposure gap can be set depending on your preferences. Longer times let you check the exposure. EOS 30D 1.25 ? ? Metro station "Hallesches Tor" in Berlin. The bracketed images were merged using enfuse, own work. Old town in Krakow. Merged using enfuse and stitched with Autopano, own work. HDR-Jack 2 built by Björn Hövelmann. A socket was used to allow reprogramming of the AVR. HDR-Jack 2 built by Sönke Martens. 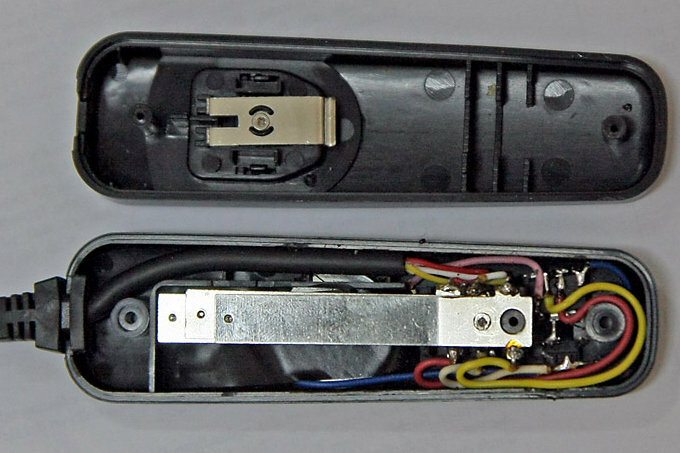 The button is positioned in the lower end of the cable release body. HDR-Jack 2 built by Felix Kramer. HDR-Jack 2 built by Kerstin. The circuit consists of just three parts. The ATtiny25 AVR microcontroller, a push-button and a battery. The whole circuit has a current consumption of just 5 uA in active mode and <0.5 uA in stand-by. Assuming an average supply current of 1 uA and a battery capacity of 200 mAh a theoretical life time of 200000 hours can be expected. This is more than 20 years. The ATtiny25 can be replaced by the ATtiny45 or ATtiny85. The only difference is the flash memory size (and the price). 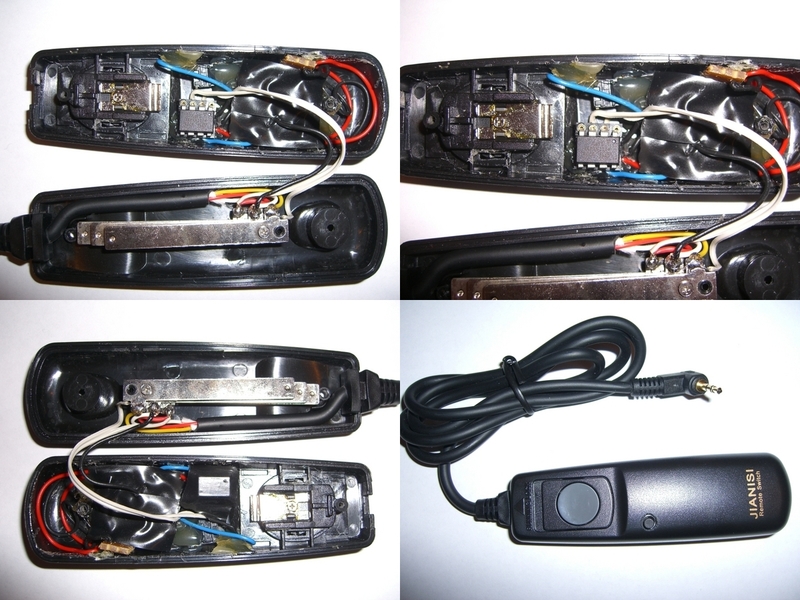 There is also a low voltage version of the controller with a V appended to the name (ATtinyXXV). It is also a very good (or even preferred) choice. The battery should be a 3 volt lithium type or a stack of standard batteries. The 2032 is a good choice because of the large capacity and good availability/price. 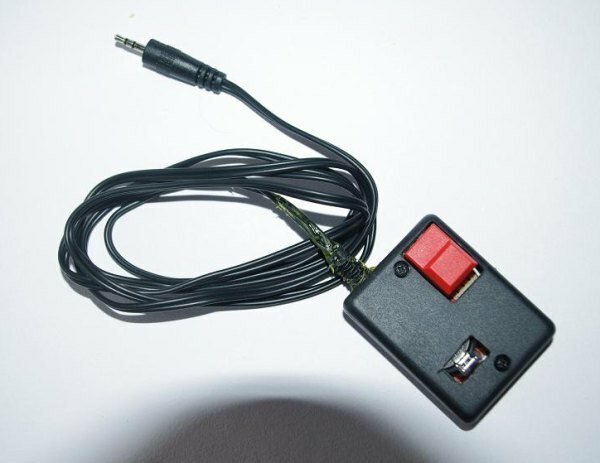 For the push-button a standard tactile switch can be used. A plunger length of ~3.5 mm is recommended if the switch is mounted as shown in the title picture above. The code is written in C. Because the controller is permanently connected to the battery, it is essential to keep it in power-down mode most of the time to save battery life. All timing functions are implemented using the watchdog timer running at 128 kHz. The watchdog timer is strongly voltage dependent, but does a good job in the application described here. 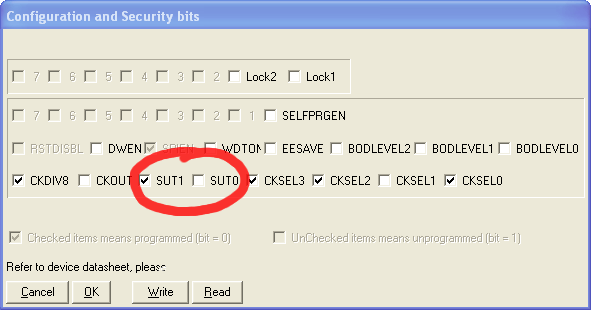 After initialisation the uC is put into sleep until the button is pressed. Depending on the number of presses and the duration of the last press, one of the functions described above is executed. Each function ends with a hardware reset carried out by the watchdog. The configuration functions make use of the EEPROM of the AVR to store the values permanently. You will need a programmer to transfer the hex and eep file to the microcontroller. There is a big variety of programmers on the market and on DIY web sites. Depending on the features (USB, parallel port, JTAG, debugging functions) the cost ranges between 1 and 100 Euros. I use a home-brew STK200 clone for the parallel port. I you want to buy a programmer, go for a simple and popular (forum support) USB version. The good thing about programmers is that any programmer will program any AVR microcontroller. If you have your programmer working, the programming is rather straightforward. It is advisable to change the fused called SUT0 and SUT1 to 'fast rising power' to avoid the current peak after power-on. This is recommended but not necessary for correct operation of the HDR-Jack 2. The clock source is unchanged (8 MHz internal oscillator). Do not forget to program the EEPROM! For post-processing of the images I recommend to use enfuse with enfuseGUI. Both programms are free. The author takes no responsibility for any injury or damage resulting from the operation or construction of the device presented here. Ich habe folgendes Problem: Ich habe den HDR Jack2 erfolgreich nach gebaut und nach einem Fehlschlag in der Programmierung des Atmels, nun beim zweiten Versuch, alles hin bekommen. Die Platine (Atmel) löst einwandfrei an meiner Sony Alpha 580 aus. Mein Problem sind jedoch die vorgegebenen Belichtungszeiten. Sie sind einfach zu lange. Selbst wenn ich mit Blende 22 und ISO 100 ein Motiv am hellen Tag festhalten möchte, sind die Belichtungszeiten immer noch zu Hell für mein Sigma 10-20mm. Ist es möglich den Sourcecode zu erhalten, bzw. Es wäre mir sogar lieber, besteht die Möglichkeit, dass Du die Belichtungszeit verkürzen könntest und mir ein manipuliertes HEX File zukommen lassen könntest?? ich würde gerne ein für die Canon 600 D bekommen. Wie (und zu welchem Preis) wäre dies möglich? Your HDR-Jack and this improved version are excellent DIY projects. Would you be able to share the source code for HDR-Jack 2? Ich würde gerne eines für die Canon 50 D bestellen. Wie (und zu welchem Preis) wäre dies möglich? gibt es die Möglichkeit einen HDR-Jack 2 für eine Nikon D90 bei Ihnen zu bestellen? Wenn ja, welche Kosten würden dann auf mich zu kommen? Ich würde gerne ein HDR-Jack bestellen (EOS 550d). Bitte teilen Sie mir das nötige mit. auch ich würde gerne einen HDR Jack 2 für meine Alpha 350 erwerben. Über eine positive Antwort mit einem Preis würde ich mich sehr freuen! ist es noch möglich einen HDR-Jack 1 o. 2 zu erwerben. Falls ja würde ich mich über eine Antwort freuen. Das GerÃ¤t wÃ¼rde mich fÃ¼r die 5D MK 2 sehr interessieren. Was wÃ¼rde es kosten und wie lange mÃ¼sste ich warten. Both versions of the chip can be used. The tiny25 and the tiny25V are ok. 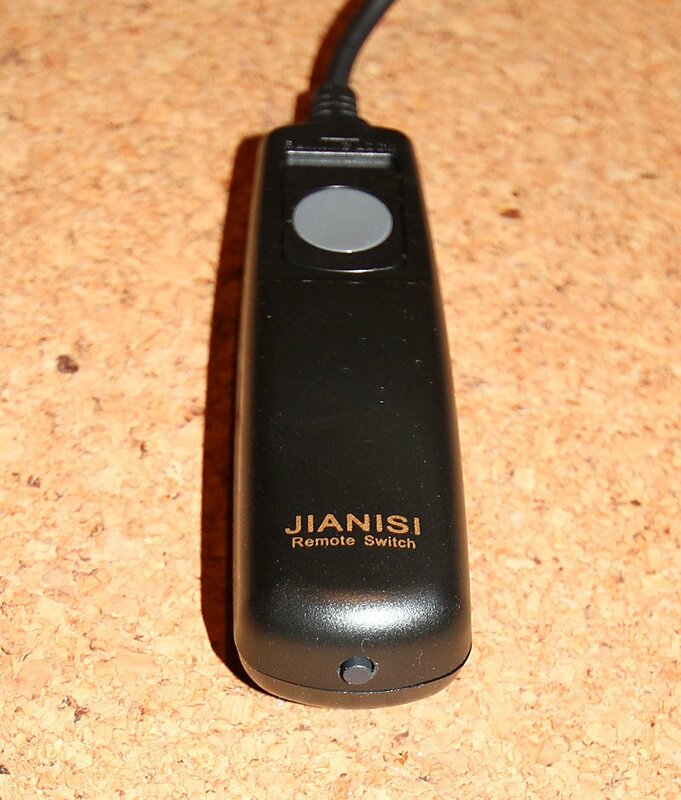 The chip is supplied with 3 V from the battery, so the supply voltage is not critical here. ATTINY25V-20SU or ATTINIY25-20SU they are smilar but only voltage. dont have alternative chip for it. Atmel has much type chip. Hallo Luk ich habe eine Sony Alpha 500 und bin an einem Fertigen HDR- Jack interissiert könnten Sie so einen bauen? Wenn ja wie teuer wäre das ? Hallo, leider ist mein Englisch so schlecht das ich auf dieser Seite nicht alles nachvollziehen kann. Would you please publish a source code for the program. I like to port it to PIC microprocessor. I am familiar with it and have the programmer and a compiler. Hallo Luk ich interessiere mich für einen fertigen HDR Jack 2. Könnten Sie so einen bauen und was würde das kosten? Jede Menge Anfragen von willigen Kaeufern. Wenn ihr eure Email Adresse und Preisvorschlaege hinterlassen wuerdet, dann koennten sich andere Hobbybastler mit euch in Verbindung setzen. Hi da ich auch zu den Leuten gehöre die schlecht Basteln können ,währe ich auch an dem HDR Jack 2 fertig zusammen gebaut für meine Canon 50D sehr interessiert. ich bin wie viele Andere auch an dem HDR-Jack 2 interessiert. Teil mir doch bitte den Preis sowie die Zahlungsmodalitäten mit. auch ich würde den HDR-Jack 2 sehr gerne für meine Canon 50D erwerben. Ich bin ein purer Anfänger in Sachen HDR und habe deinen HDR-Jack 2 gesehen, der mich fasziniert. Produzierst du immer noch welche. Ich wäre mit einer Canon EOS 400D sehr daran interessiert. Was wären die Kosten für ein HDR-Jack und die Lieferung in die Schweiz? ich bin an einem Fernauslöser mit Belichtungsreihenfunktion für die 5D MarkII interessiert. Wie kann ich so ein Teil käuflich erwerben? PS: Habe noch ein paar Prints übrig. Besteht Interesse daran? ich bin sehr ein Einem fertigen HDR-Jack 2 für meine Canon 5D MII Interessent. Was kostet es, WENN SiE IHN MIR Komplett Liefern? Versand nach Österreich. Vielen Dank für your unterstützung. 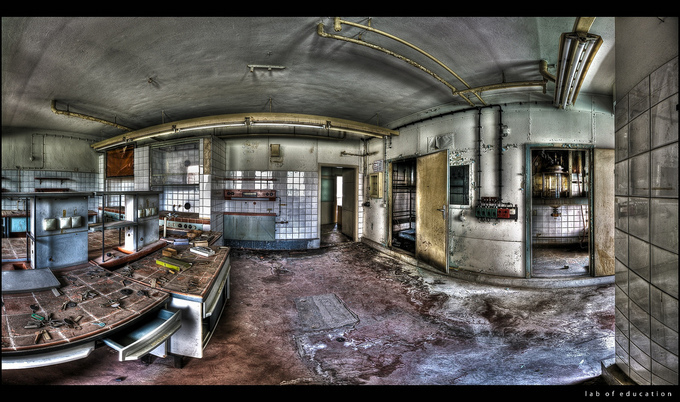 ich bin sehr an einem fertigen HDR-Jack 2 für meine Canon 5D MII interessiert. Was kostet es, wenn Sie ihn mir komplett liefern? Versand nach Deutschland. die Sourcen des HDR-Jack 1 sind offen (siehe Nachbarartikel). Der Code des Jack 2 ist sehr ähnlich nur deutlich unübersichtlicher. Er ist nicht offen. Cooles Projekt! Habe vor einiger Zeit ein ähnliches Projekt versuche, habe aber den ATtiny84 verwendet. Ich würde deshalb gerne versuchen das Programm für den ATtiny84 anzupassen. Sind die Sourcen vom HDR-Jack 2 auch verfügbar? Was würde es mich kosten wenn ich nur den programmierten Microcontroller von Ihnen bestelle? Ich hätte auch gern so ein Teil. Kann ich das bei Ihnen käuflich erwerben? auch ich würde den fertigmontierten HDR-Jack 2 gerne für meine Canon 450D kaufen. Für nähere Infos wäre ich sehr dankbar! ich hätte auch gern einen hdr jack 2.was kostet er?sind zur zeit welche verfügbar? Ich bin gelernter Maschinenbauer und habe mit elektrik nichts am hut hätte aber gerne für meine EOS1000D gerne so ein teil. Gibt es die möglichkeit mir so ein teil zu verkaufen???? Einen Kabelauslöser besitze ich schon kann man den verwenden?? Fragen über fragen antworten bitte an die matrix. das ging ja flott, also wie gesagt bin sehr an diesem Stecker Interessiert. Bitte schreib mir die Zahlungsmodalitäten auf. Das Geld geht dann sofort raus. Danke nochmals für die schnelle und Positive Antwort. ich möchte auch gerne einen HDR Jack 2 für meine Canon 5D bestellen. ich möchte gerne einen HDR Jack 2 für meine Canon 400D bestellen. Ich habe eine Sony Alpha 350K und würde mich auch für den Jack2 interessieren. Was würde es den kosten wenn sie mir einen bauen würden . Bitte informieren sie mich per Email. Bin leider kein sehr begabter bastler. da ich kein Elektroniker bin, die Frage ob auch ich einen HDR Jack II für meine EOS 50D bei Ihnen bestellen kann ? auch ich würde den HDR-Jack 2 sehr gerne für meine Canon 50D käuflich erwerben. ich möchte mich auch in die Warteschleife der Besteller für den HDR-Jack II einreihen. Benötige der HDR-Jack II für meine Canon 50D. Wär sehr schön, wenn das auch für mich Lieferbar wäre. Würde den HDR-Jack auch gerne käuflich erwerben. Habe eine Canon 40D. Die Aufnahmen sind ja absolute Spitzenklasse. First of all I want to congratulate you for the great work. 1. Can you join the functionality of HDR Jack 2 and SmartTrig? 2. Can you add switches to turn on/off the photodiode and the audio transducer in the SmartTrig? 3. How can I order and what are the prices of these assembly’s (programmed) for Canon 450d? PS: Norbert Löv, can you upload some details about your wired grip, maybe they can be incorporated in a more advance design. Noch ein Nachtrag: dank der Intervall-funktion werde ich nun auch in Zkunft die beiden Hobbies: Fotographie von Feuerwerk & Freundin miteinander vereinbaren können. Aufbauen, Einstellen, Feuer frei im Interval-Modus und genießen. Zuhause dann sichten. Außerdem kann ich damit auch mal endlich mit Zeitrafferaufnahmen etc. experimentieren. Danke für diesen wundervollen Trigger, das erspart nicht nur viel Arbeit und Einstellung an der Kamera, auch wird die Belichtungsreihe länger als nur über 3 Stufen ohne zwischendrin an der Kamera zu fummeln und ggf. das Stativ etc. dabei zu verwackeln. many thanks for the feedback on the 20D. I investigated the battery grip bracketing idea recently. I think it should work fine. There is enough space to embed an AVR inside the grip and the power supply is no problem. 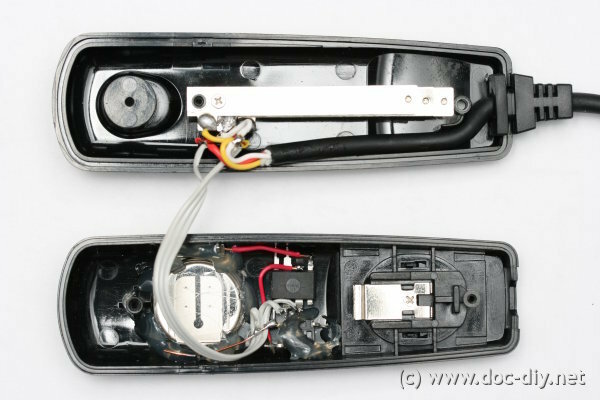 Take a look on the article "EOS battery grip disassembled" on this site. You'll find there a close-up of the dial wheel and a description how it works. HDR Controll via Battery Grip? But using manual mode should work!? Just think about a HDR Timer which is build in the battery grip. I would build a switch into the battery grip to start and stop the timer mode. I think this would be a nice thing, you just have to adjust the start expose timer before activating the timer. The timer would increase the time after each shot until you stop the timer. You would have images with correct exif information. Is there anybody building something like this before? HDR Jack2 on my Canon EOS 20D works perfect!!! I use to have a AVR Butterfly to make HDR's in Bulb mode of my 20D. Now I have have a HDR Jack2 and everything work fine to me! For me everything works PERFECT!! !